Shamann Walton looked at ease as he stood in the Laughing Monk Brewery on Egbert Street in the Bay View area. This was the site of his District 10 campaign victory celebration and he had just found out he was ahead in the District 10 election to succeed Supervisor Malia Cohen, who held the previous 8 years. As the evening wore on, Walton would win the District 10 election with 42 percent of the vote, compared to his two main challengers, Tony Kelly with 24 percent and Theo Ellington with 20 percent. “I am excited to have won and be representing a district where I am from and a place I been fighting for over the last twenty years,” said Walton. Born and raised in San Francisco, Walton, 43, grew up in Bay View Hunters Point in West Point and later in Potrero Hill. When he got to middle school, he moved to Vallejo, where he attended Vallejo Junior High and Vallejo High School. He went to college in Atlanta, where he attended Morris Brown, graduating with a degree in Political Science. After college, he came back to the Bay Area, first working in Vallejo at the Boys and girls Club and then with the Solano County Office of Education. He would later move back to San Francisco where he was the Director of the Economic Opportunity Council at the Potrero Hill Family Resource Center. He later transitioned over to Young Community Developers, a workforce development non profit in Bay View, where he has been the Executive Director the past eight years. 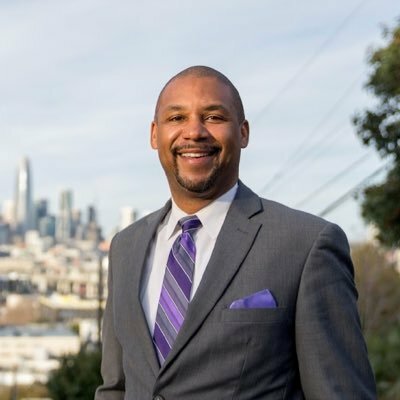 In 2010, he dipped his foot in politics, running and winning a seat on the San Francisco Board of Education. Walton is currently the President of the San Francisco Board of Education. He will step down from this board and YCD, when he gets sworn in as the Supervisor for District 10 in January. He entered the 2018 race with a higher profile than any other candidate. He also had the endorsements of then San Francisco Mayor Ed Lee, State Assemblyman Phil Ting and State Senator Scott Wiener. “My main themes during the campaign were housing affordability, homelessness, community safety and equity in the community,” continued Walton. He said that District 10 hasn’t had its fair share city resources, compared to other districts. He has already been advocating for these recourcs, even before the campaign. Walton said addressing the issue of transportation in Bay View has been long overdue and he has started with talks cities main transportation agency, MUNI, to make some changes. He said District 10 also needs more resources for homeless shelters and substance and mental health support and services to deal with the growing number of homeless people in the area. Francisco just opened up a homeless Navigational Center at 125 Bayshore Blvd to provide services to homeless people. Walton said that District 10 needs homeless service centers in the entire district area. “I will be a supervisor that will roll up sleeves and out in the neighborhood so the district can thrive,” added Walton.